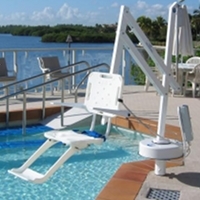 A pool lift is designed for elderly who need assistance accessing a pool (ie. they cannot use the ladder or steps). In the photos below, you will see that they are located near the edge of the pool and the senior is lowered into the pool in a chair. They are great for elderly who have difficulty with stairs or ladders due to decreased strength, pain, endurance and many other health issues. Water activity is very beneficial for a senior's health - both physical and emotional well-being. Water can relieve pain and promote movement as the water supports the senior - taking some of the stress off their joints. 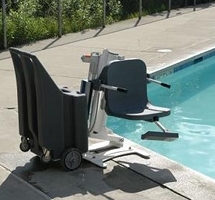 Read more below to determine if a pool lift would be helpful for the elderly in your life. 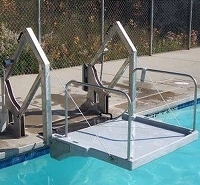 A pool lift is designed for elderly who cannot safely enter/exit a pool using the existing ladder or stairs. Using a pool - even for walking - has health benefits and is enjoyable. The buoyancy of the water can alleviate joint pain which is a common compliant amongst seniors (hip/knee pain). Pool therapy can speed recovery from injury or post surgery - such as hip or knee replacements. Staying active and continuing to do hobbies and interests is important both for physical and emotional well-being. Battery or water powered - Are easier and more convenient than manual models. Weather proof - This is especially important in extreme climates such as intense sun in summer and snow/rain in winter. Weight capacity - Make sure your elderly parents are under the weight limit. Foot and arm rests - They should flip up and out of the way when getting on/off chair. This makes it safer and more comfortable to use. Pool lifts are easy to use. The most common style uses a chair to transfer the senior into the pool. Wearing a life jacket is recommended for seniors who are not good swimmers or have health issues that can affect their swimming ability. Power - Either battery or water powered. Chair or sling - There are both chair or sling styles. Chairs are more convenient. Wheelchair use - Will anyone with a wheelchair need to use it? Deck area - Make sure deck is clear so there is enough room around lift location for walker or wheelchair. Footrests and armrests - Some do not have one or both. A pool lift costs ~$4000 and up - depending on the style, installation and features needed. Ceiling Lift - A ceiling lift can be used with a sling to move a senior between furniture/equipment. Requires use of a sling and are battery powered. Bathtub Lifts - Allows seniors to bathe safely as it raises/lowers them into a bathtub. Battery or water powered. Hoyer Lift - A portable wheeled lift which can be used to transfer seniors between equipment/furniture. They are either manual or battery powered and require use of a sling.